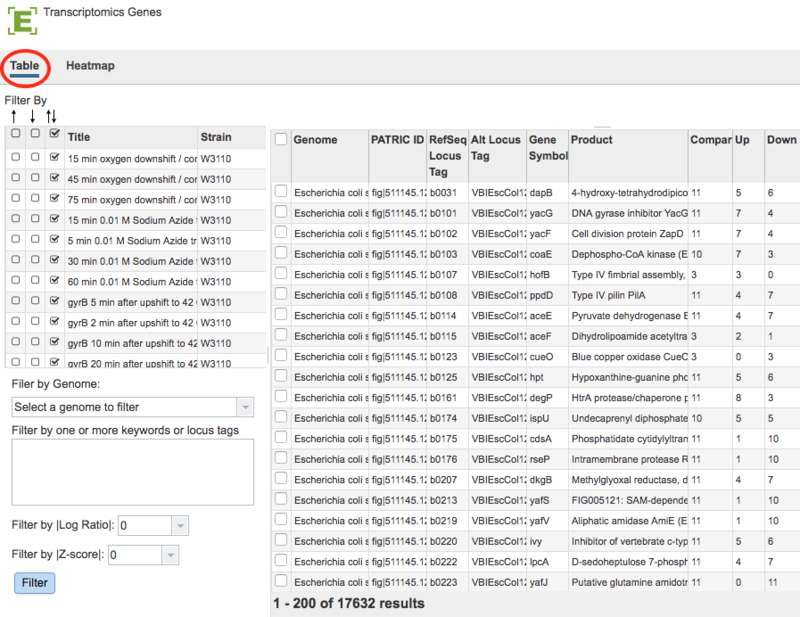 A Gene List in PATRIC is a custom user-created list of genes based on the transcriptomics datasets of interest. Each Gene List displays all of the genes present in selected datasets, their functions, and summaries of their expression levels in various samples or comparisons. A Gene List can be dynamically filtered based on the identifiers, product/function, expression levels, or up/down regulation in one or more comparisons. Any subset of genes of interest can be downloaded along with the annotations and expression values as tab-delimited text or Excel file; or saved as a Workspace group for further analysis. A complementary Heatmap Viewer enables quick sorting or clustering of genes and comparisons; and visualization of genes that are similarly expressed across one or more comparisons. *Clicking the Genes Action Button with one or more rows selected in the Experiments Table: Opens the Transcriptomics Genes Filter Tool and Table/Heatmap page, loaded with the genes corresponding to the selected experiments. See Transcriptomics Experiments and Comparisons for more information. *Clicking the Genes Action Button with one or more rows selected in the Comparisons Table: Opens the Transcriptomics Genes Filter Tool and Table/Heatmap page, loaded with the genes corresponding to the selected comparisons. See Transcriptomics Experiments and Comparisons for more information. Filter by up- or down-regulation by clicking the corresponding up, down, or up/down (^, v, or ^v) checkbox beside the condition Title. Filter by Gnome by selecting a genome in the dropdown list and clicking the Filter Button. Filter by Keyword or Locus Tag by entering the desired keyword(s) in the text box and clicking the Filter Button. Filter by |Log Ratio| by selecting a value from the dropdown list and clicking the Filter Button. Filter by |Z-score| by selecting a value from the dropdown list and clicking the Filter Button. The data in the Gene List Table provides summary information for the selected genes including Genome name, PATRIC ID for the gene, RefSeq Locus Tag if available, Alternate Locus Tag if available, Gene Symbol, gene Product, number of Comparisons associated with the gene, number of comparisons with Up regulation, number of comparisons with Down regulation. Sort the list of genes by clicking on the column headers. Download the entire contents of the table in CSV (Excel) format by clicking the Download button above the table on the right side. Hide/Show: Toggles (hides) the right-hand side Details Pane. Feature: Loads the Feature Page for the selected feature. Available only if a single feature is selected. Features: Loads the Features Table for the selected features. Available only if multiple features are selected. Genome: Loads the Genome View Overview page corresponding to the selected feature. Available only if a single feature is selected. Genomes: Loads the Genomes Table, listing the genomes that correspond to the selected features. Available only if multiple features are selected. FASTA: Provides the FASTA DNA or protein sequence for the selected feature(s). ID Map: Provides the option to map the selected feature(s) to multiple other idenfiers, such as RefSeq and UniProt. MSA: Launches the PATRIC Multiple Sequence Alignment (MSA) tool and aligns the selected features by DNA or protein sequence in an interactive viewer. Pathway: Loads the Pathway Summary Table containing a list of all the pathways in PATRIC in which the selected features are found. Group: Opens a pop-up window to enable adding the selected sequences to an existing or new group in the private workspace.